These tutorials were written for Circled and Elemental, to aid in grafting the Hats. The techniques will have other uses, too, so I'm making them public as free downloads. The best information is by far what's in the books as that's far more comprehensive (and better laid out!) but these are pretty thorough in and of themselves. Please bear in mind that these are written with specific patterns in mind, namely sideways knit Hats that require a top to bottom graft. I plan to talk about this much more at length in the hopefully not too distant future! These are all on the Grafting page - images below link there. 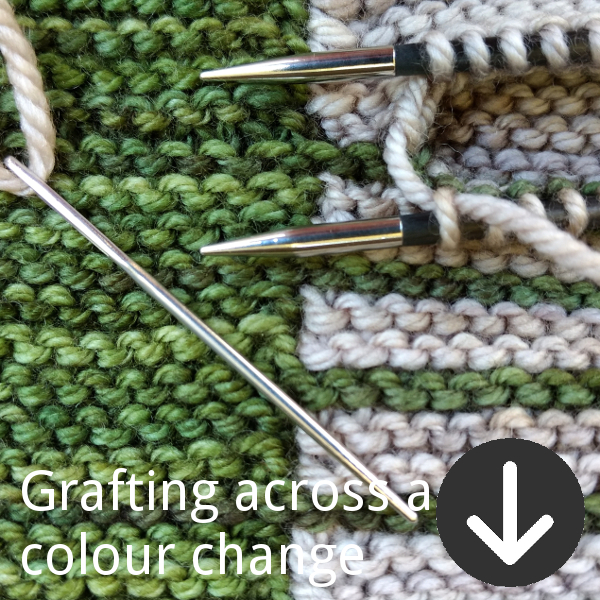 This tutorial replaces my original garter grafting tutorial as it's far more thorough and indepth and covers a few more things when grafting a sideways knit Hat with a top to bottom graft. 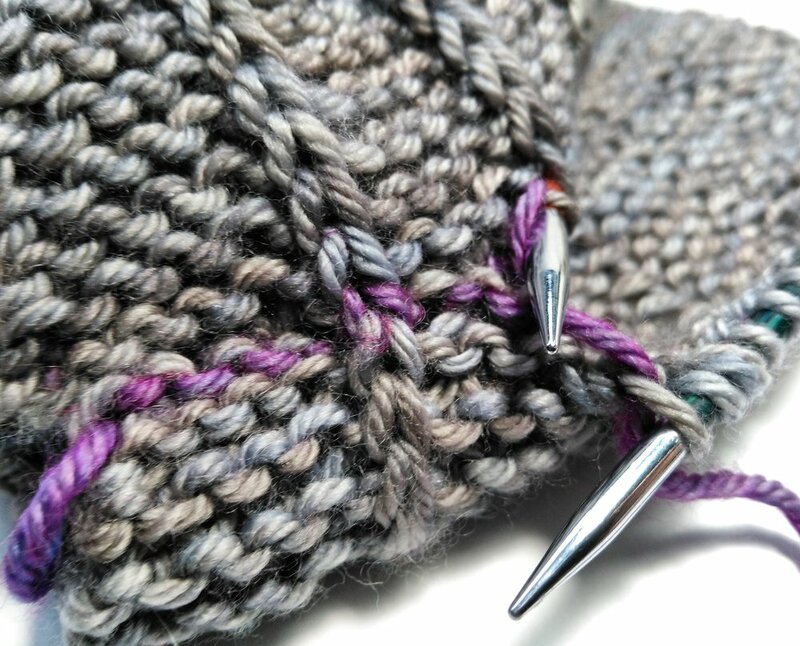 Although this was written for Azula and Parallelo, the same principles would apply when grafting any kind of colourwork in stocking stitch or garter stitch that's top to bottom. Grafting slipped stitches comes a two-parter, as there's a fair bit of prep involved (slipped stitches onto a provisional cast-on will do that ;) It's worth the effort though, as just look at those clean lines in the photo below! Part two of the two-parter - make sure you grab both of them. There's an awful lot more I want to say about grafting but honestly, my head's not been in the right place for it... for years, even. I have so much material and it's such a waste just sitting there in a few folders on my hard-drive but bringing it all together was going to take some mighty effort. So I kinda gave myself no choice about it by proposing new workshops and having them sell out at EYF! And now I've basically written a book about it. Except I'm not wanting to publish a book because I don't want that kind of pressure, but I would like to share much of what I've learnt here. Seems that what was causing my head to crash with it was one or two tiny pieces missing in the puzzle and now I have those, my brain is back together and my confidence much healthier. I'd basically got it all worked out anyway, I just hadn't noticed the obvious. Is it alright with you that some time later in the year I start a Kitchener Diaries blog series? And share all this info in bite-sized chunks? ps/ my Introduction to Kitchener and Advanced Kitchener classes haven't sold out yet at Woollinn (I believe!) - it's going to be an amazing class, and I'm keen to see you there. I'm going to talk about this here, as it's come up a lot over the last few weeks, and I'd like to put a couple of things straight. The Elemental Hats are not swing knitting. They don't use the technique. They are short row colourwork but that's a broad umbrella! I'm not fully versed in swing knitting, but as far as I understand it, it's a method for maintaining balance within a flat piece of fabric that uses short rows to manipulate the fabric and thus create colourwork patterns. The aim of swing knitting is to guide you and create a rthythm to your work that follows the dips and flow of the short rows, and that doesn't take into account the need to use short rows for shaping. Those of you who have knit any of the Elemental Hats will know that the short row forms are not all the same, and in some cases, not even the dominate feature. The only one that comes close is Korra, but even then that uses instarsia and still has those additional short rows for the crown and brim which would otherwise break up a rthythmic flow. Swing knitting has picked up pace recently and is being recognised as a technique, which is great. It is though one method for creating short row colourwork, or perhaps a discipline is a better way to describe it. But it isn't the only way, and I wanted to clear this up before too many more people start linking the Elemental Hats with the swing technique. Parallelo and Scourie use the same techniques as the Elemental Hats but I don't think they could be linked in the same way. Taking a technique and adding in a 3rd dimension changes it muchly, and perhaps that's more evident when it's knitted?